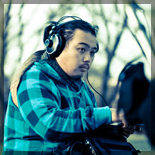 Robert Li, otherwise widely known as Chum (and often credited as Robert Chum Li), is a recent graduate of Swinburne University (Bachelor of Arts – Honours (Games & Interactivity, Social Science, Media & Communications), 2010), Victorian College of the Arts (Film and Television Foundations, 2010) and the Academy of Makeup (Diploma of Makeup Artistry – Injury Simulation, 2009). He is currently pursuing an Doctorate in Philosophy at Swinburne University of Technology. His rambling interests have taken him into the fields of games production, film production, makeup artistry, media studies, graphic design and photography, all in professional capacities. He sees his specialty lying in new media and the convergence of the mediums he has practiced in, but prefers to use more traditional means to describe them, such as with fountain pens he calls Gunter and Michael Clarke Duncan (an homage to the towering actor of Green Mile fame) and pad of lined Rhodia paper. Currently, his main focus is his PhD Candidacy, and not fumbling it. His thesis, is in the early stages of construction and is subject to radically invert at any time without notice. At the moment, the main focus of it has been the historical materialist deconstruction of the historical societal structural developments within massively multiplayer online role-playing games (MMORPG), determining whether their current state is indicative of a late digital feudalism, and seeing whether real world historicity can inform the future of MMORPG social development. He is an avid vegetarian cook, who has devised ingenious ways of substituting meat, and shares he love of food with his pets, Milly, a fluffy ginger Northern Short-hair, and, especially, Stanley Kubrick, his 2 year old, rambunctious Beagle. While previously an avid brass musician and vocalist, his chops have gotten rusty of late, and can only be opened through copious lubrication from the effects of alcoholic beverages.